Are you a steampunk fan? Or is this post an introduction to the genre? 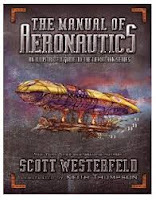 Leanne Rands introduces this fascinating, challenging and engaging genre by looking at a classic series: The Leviathan Trilogy by Scott Westerfeld. Recently l was introduced to steampunk novels which is an eclectic subgenre of speculative fiction combining fantasy, horror and science fiction, set in a Victorian or quasi-Victorian historical setting. Steampunk has been described as; "What the past would look like if the future had happened sooner" (Kankuro (2004) in Urbandictionary). While steampunk novels are set in an era when steam power is predominantly used as the main energy source, there are also fictional technological inventions similar to those found in the novels of H. G. Wells and Jules Verne. Inventions such as H.G. Wells’ Time Machine (1895) and Jules Verne’s Nautilus submarine in Twenty thousand leagues under the sea (1870) are creatively adapted and combined with modern computer technology to provide intriguing machines. Many titles include intricate diagrams and illustrations of the inventions to add to reading experience. 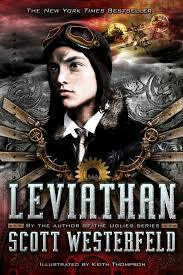 The Leviathan Trilogy by Scott Westerfeld is set in an alternate World War I. The German Central Powers (Clankers) using mechanized war machines are at war with the British Entente Powers (Darwinists) who use genetically fabricated creatures as weapons. The teenage heroes are Aleksander, son of Archduke Franz Ferdinand, and Deryn, Scottish girl with dreams of joining the British Air Service with her brother. The trilogy tells the story of their around the world adventures. The series also has a manual that provides comprehensive background information that is informative, imaginative and intriguing. The Leviathan Trilogy by Robert Westerfeld is suitable for older readers and has engaging characters, astonishing technology, and exciting plots. The behemoth is the fiercest creature in the British navy that can swallow enemy battleships with one bite. On board the airship Leviathan the heroes Deryn and Alek continue their fight to bring the war to an end. Alek and Deryn are on the last leg of their round-the-world quest to end the war and reclaim Alek’s throne as prince of Austria when they fall in love. Their quest is being thwarted as their ship, the Leviathan, continues to detour farther away from the heart of the war (and crown). This manual is the decoder that unlocks the mysteries and explains the inner workings of the Darwinist and Clanker powers. There are detailed descriptions of the Darwinist beasties and Clanker walkers, weapons, transport, and uniforms. The manual also highlights the international powers that Deryn and Alek encounter throughout their adventures. Editor’s note: Steampunk fans love to dress for the occasion. If you live in northern Tasmania, why not attend the Steampunk Festival in George Town on 24 June - you will be amazed!! Feel free to add a comment to share information on other great steampunk titles. I will make a start with Alex Woolf’s Iron Sky books – Dread Eagle and Call of the Phoenix.